Fox News and their related web sites, including The Fox Nation, have been on a crusade against ACORN for months, with personalities like Glenn Beck, Bill O’Reilly and Sean Hannity devoting hours upon hours toward the witch hunt, which has uncovered some wrongdoing. 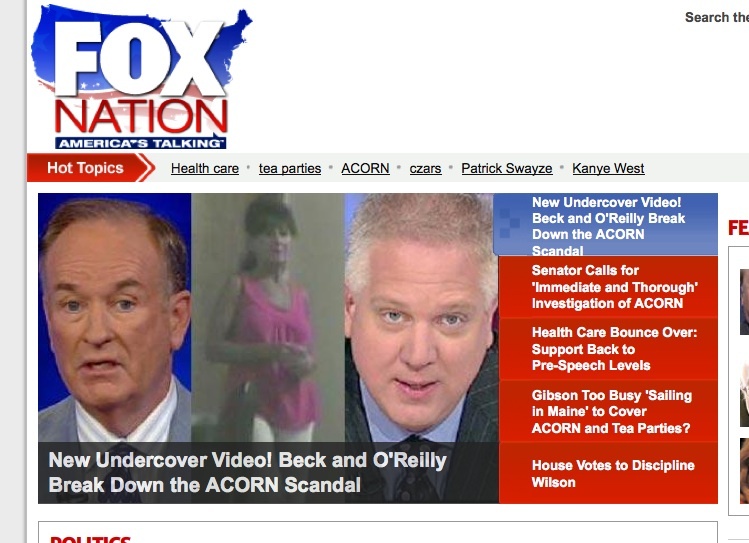 But, this is a hilarious prank by an ACORN staffer against Fox News’ “gotcha” (to use a Palinism) style of journalism. “They were not believable”, said Ms. Kaelke of the two actors. “Somewhat entertaining, but they weren’t even good actors. I didn’t know what to make of them. They were clearly playing with me. I decided to shock them as much as they were shocking me. Like Stephan Colbert does – saying the most outrageous things with a straightface.” While her sense of humor might not be funny to many people, the fact is that she spun false scenario after false scenario and the videographer ate them up. Not only was this a witch hunt against ACORN, but also against the so-called liberal media, which Fox News repeatedly pointed out has not covered this story about ACORN. Obviously, it was for a good reason… Perhaps, Fox News should spend more time vetting its sources rather than slamming the mainstream media, of which they are a part. Witch hunt? The US Census Bureau has cut all ties to ACORN and the Senate voted 83-7 to defund it based on the corruption uncovered by this multifaceted investigation. Tresa Kaelke was not “the focus of a series of videos released by Hannah Giles and James O’Keefe” as you stated. That is an outright falsehood. Kaelke, an ex-con with a restraining order against her, was in just one of the videos. ACORN was the focus. Kaelke’s bizarre behavior and statements were just a peculiar sidebar to the real story. ACORN employees (at numerous offices in numerous states) were more than willing to give loans and advice on how to cheat the IRS to a “pimp” and his “prostitute”. ACORN employees also didn’t bat an eye when told children from El Salvador would be turning tricks in the house. Even Democrats have called the actions demonstrated by ACORN on these tapes “indefensible”. It sounds like you got punked. Did you know ACORN reported such suspicious activity to the police? They’re now performing an internal audit, which is obviously needed. The issue in this instance isn’t the actions of some other ACORN staffers, but the fact that FNC contributors were discovered by their bad acting and punked. FNC then reported a false story without any form of confirmation. Then there’s also the fact that O’Keefe and Giles recorded the ACORN staffers without their knowledge and permission, which, in many states, is illegal. Nice. Did you notice the screen shots of the “series of videos”? Kaelke is wearing the same outfit in all of them. It’s one video cut into segments by Newshounds. Again, there’s no series. Just one video of Kaelke recorded on one day on one visit to ACORN’s San Bernardino office. So let’s pretend Kaelke is “punking” O’Keefe and Giles. To what end? She didn’t know they had a hidden camera and Kaelke certainly wasn’t secretly recording them with Ashton Kutcher waiting in the wings. Kaelke is just a liar and ACORN is trying to spin their way out of this mess. You seem hung up on the fact that FNC didn’t investigate Kaelke’s murder claim before they aired the story. Kaelke made the claim, no one on Fox called her a murderer. Kaelke’s words are her own. FNC has no responsibility to confirm them unless they make the accusation. The only “nice” thing about this is ACORN won’t be involved in the next census and they won’t be embezzling/misusing/abusing taxpayer money anymore. Plunket, Again, nice try. Newshounds did not break up the video – the screen shot, while hosted by Newshounds, is of FoxNews.com – It is a series of videos. Parts 1-4 + 3 others make a series. How can you say that she didn’t know they had a hidden camera? She said that she saw how bad their acting was and decided to have a little fun… Obviously she knew what was going on… And the best part – “FNC has no responsibility to confirm…” That is their WHOLE responsibility as ethical journalists. But, since they’re not, I guess they don’t have the responsibility. Either they’re ethical, or they have no responsibility. They can’t have it both ways. I doubt she guessed she was being filmed but I do totally believe she was playing on them. It seems so obvious and odd that they didn’t realize it. This is far different from the other vids.